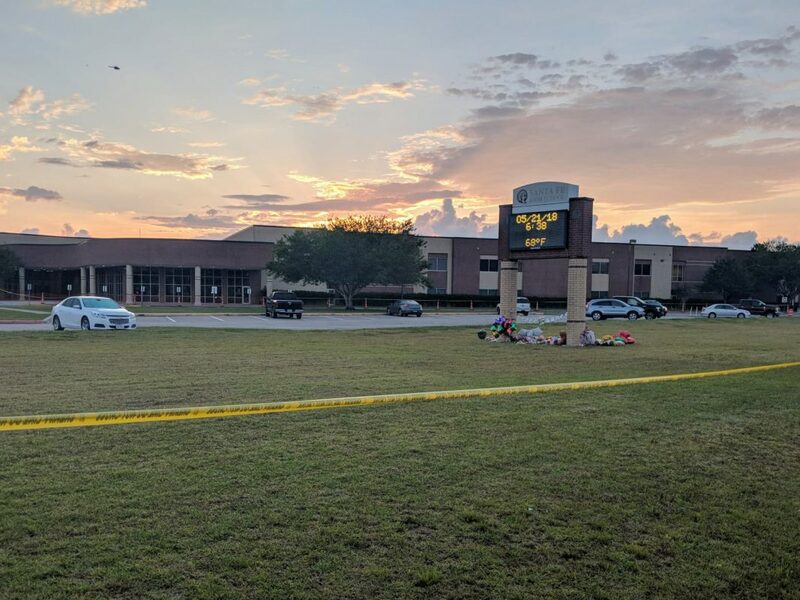 Galveston County Sheriff Henry Trochesset said officers were able to “engage” the shooter at Santa Fe High School four minutes after they were called to the scene. Trochesset said the shooter was contained Friday afternoon, with minimal gunfire from law enforcement officers. 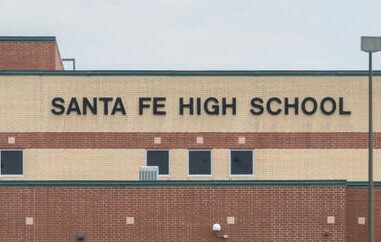 He said that allowed the rest of Santa Fe High School to be evacuated safely. How much time elapsed from the moment gunfire erupted until the last victim was shot remains unclear. Trochesset said 200 officers from law enforcement agencies throughout the region converged on the scene Friday. 17-year-old Dimitrios Pagourtzis remains in the Galveston County Jail without bond and under suicide watch, charged with capital murder. 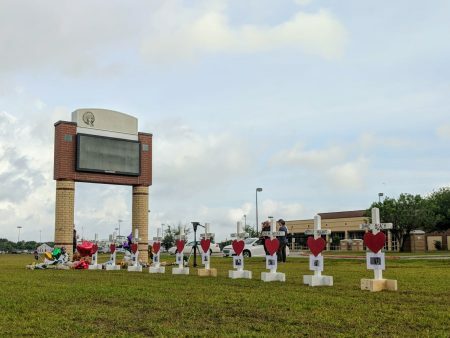 Also, Santa Fe school officials announced Monday that students won’t return to classes until after Memorial Day — on Tuesday, May 29. Santa Fe school district police Officer John Barnes has been upgraded from critical to stable condition at the University of Texas Medical Branch in Galveston, after surgery to repair his badly damaged arm. Capt. Jim Dale of the Houston Police Department had been Barnes’ sergeant when both worked together in Houston. 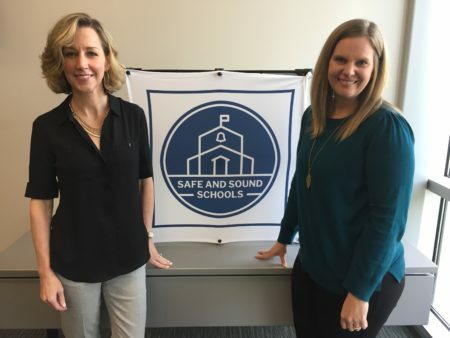 Dale, who is serving as the Barnes family’s spokesman, said Barnes spent 22 years with the Houston police before retiring the joining the Santa Fe school district police force about six months ago. Dale said Barnes remains on a ventilator and had lost a lot of blood from his wound. He said doctors worried at one point he would lose the arm but now believe it’s been saved. 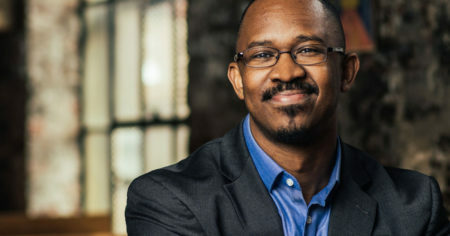 Barnes can open his hands and has movement in his limbs. 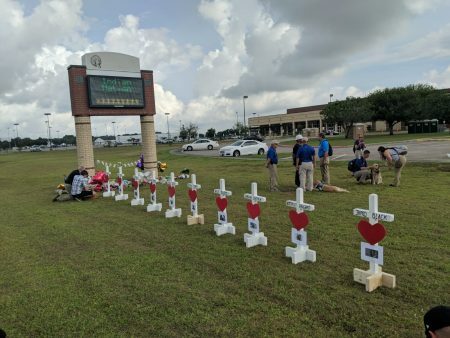 As the community in Santa Fe, TX, continues to mourn the loss of eight students and two teachers, a memorial is growing outside Santa Fe High School. Community members placed balloons, stuffed animals, and flowers underneath the school’s announcement sign, alongside white wooden crosses bearing the names of victims of Friday’s shooting. “I’ve been at this kind of thing too many times in my life” said Greg Zanis, a carpenter who makes the memorials under the name Crosses for Losses. A Chicago resident, Zanis says he has installed thousands of crosses at sites around the country. 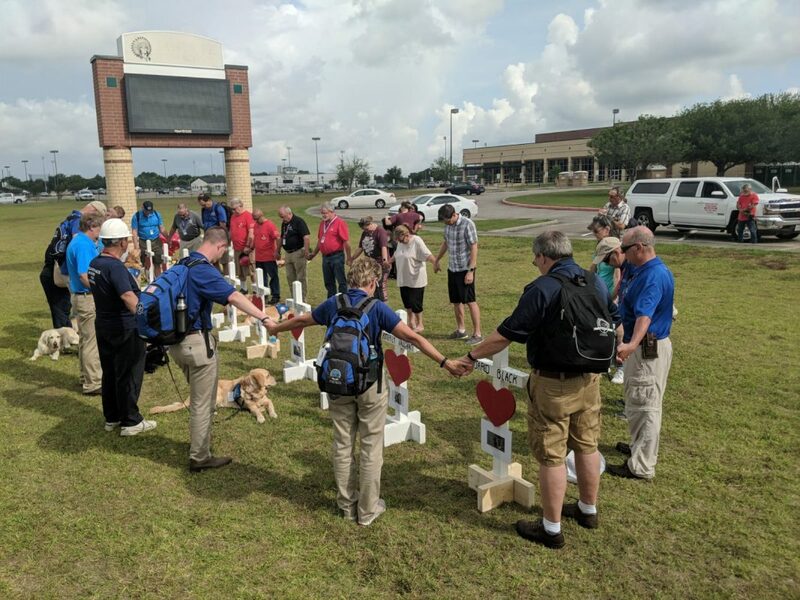 Chaplians with a crisis response team stood near the memorial with emotional support dogs, offering counseling and prayer to those visiting the high school. The memorial grows after a weekend of emotional outpour, where churchgoers in Santa Fe called for the return of prayer in schools. 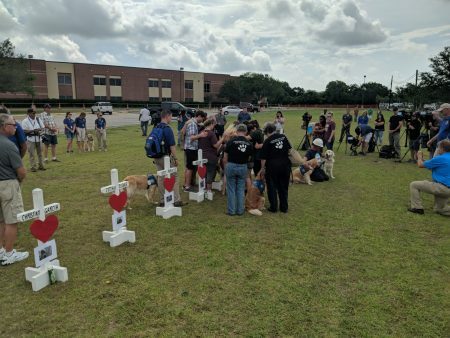 Texas Governor Greg Abbott called for a statewide moment of silence to take place at 10:00am Monday. On Friday, Abbott announced a series of roundtable discussions on ending school shootings.